Captains Creek rises on our farm at Blampied, at the foot of the Kangaroo Hills, and meanders north past the original homestead of Captain Hepburn. Four generations of the May family have run the 80 hectare farm for more than 100 years after my great grandfather, Joseph May, purchased it in 1909. Over this time, its red volcanic soils have been cultivated for many uses. 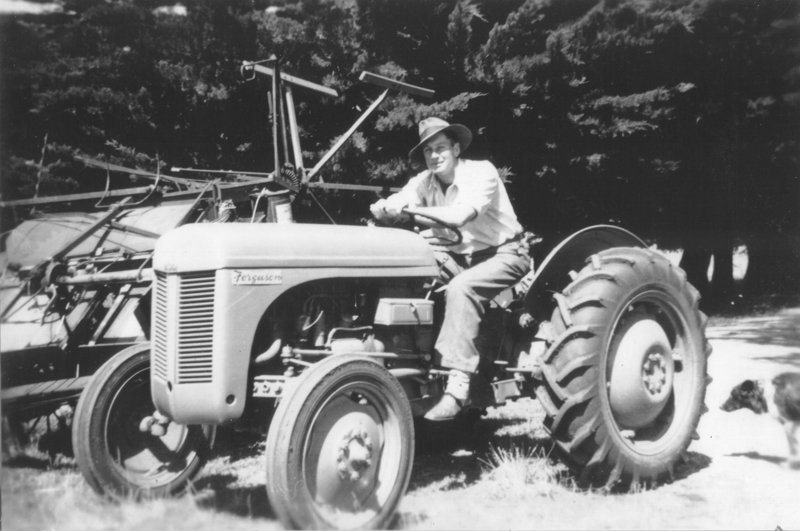 My father Maurice, who came home at age fourteen to work the farm with his father George, grew mixed cereals, hay, beef cattle and dairy cows until he died in 2012, aged 87. Today, myself, my brothers Rod and Greg, and our families manage the farm. Rod started the transition to organic farming in the 1980s, leading the way in reducing use of chemical fertilizers and pesticides. We have since established tree-crops of chestnuts, walnuts, hazelnuts, and apples, plus native trees and shrubs to provide shade and shelter for livestock. My wife Carolyn and I introduced wine grapes in 1994 with two hectares of Chardonnay and Pinot Noir, the first harvest in 1998 producing a small quantity of wine that was sold locally. Further diversification into potatoes, carrots, beetroot, parsnip, sweet corn, tomatoes, broccoli, cabbages, lettuce and much more has occurred on a seasonal basis. In 1985, Captains Creek became one of the first commercial farms to be certified “organic” with the National Association for Sustainable Agriculture Australia. Building a “cellar door” commenced in 2005, starting with the restoration of a 100-year-old workers’ hut, then adding a tasting room built with cypress milled on the farm. It features the original fireplace and shingle roof, and displays old wares and photographs from early farming days. It was opened to the public in 2006 with offerings of wine and local cheeses. With increasing visitor numbers—and growing local interest for food—we opened a small kitchen in 2009 to provide simple lunches showcasing fresh, organic produce from our farm and other local producers, including Goldfields Farmhouse cheese. We started offering wood-fired pizzas on Friday evening in the warmer months of 2011. Captains Creek Tasting Plate is a popular dish, comprising a selection of local delicacies including Tuki smoked sausage, Istra prosciutto and salami, Captains Creek olives, marinated vegetables, house-made dips and Stella sourdough breads. The venue is also used for conferences, birthdays, Christmas parties, weddings and other functions—and continues to evolve. Since our first vintage in 1998, the beverage list has grown to include sparkling and still, red and white wines, ciders from apples grown on the farm, local handcrafted beers and soft drinks, coffee and tea. We also sell local produce, including “Vegie Boxes,” where fresh, in-season vegetables are picked, packed and delivered weekly direct to local families and farmers’ markets. We look forward to welcoming you!